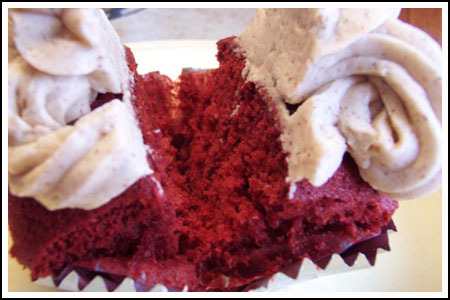 Years ago a reader named Louise wrote a review of Baked’s Red Velvet Cupcakes. I’ve since made the cupcakes a few times for friends and the consensus is that they are very good. 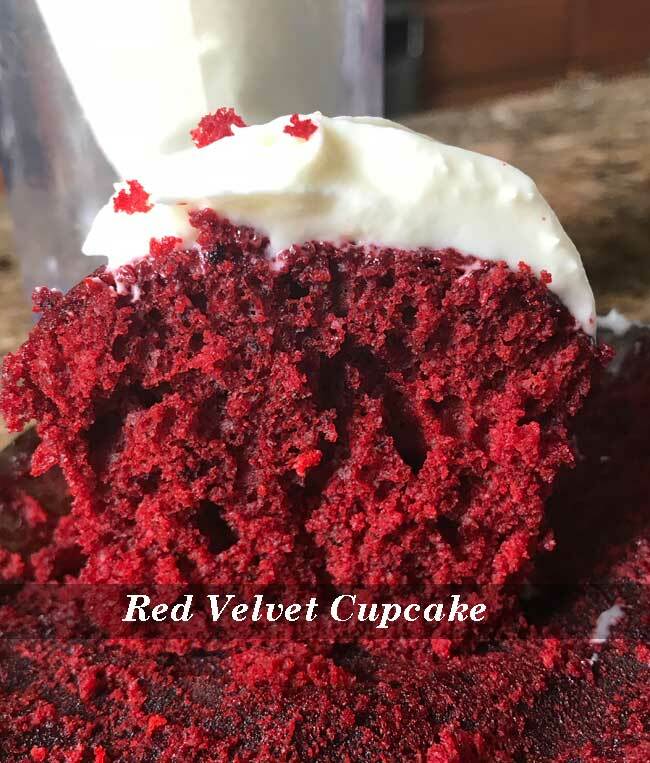 However, when you put them next much redder red velvet cupcakes like the ones from Bobby Flay’s Throwdow, the Baked Red Velvet Cupcakes are mistaken for chocolate. 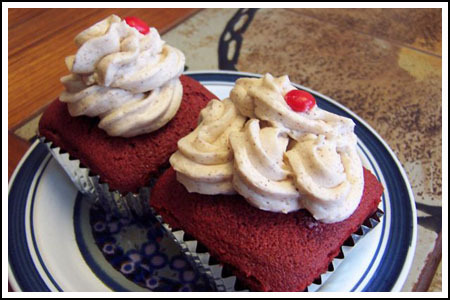 Still, the cupcakes are fine and Baked’s use of a cinnamon flavored frosting is creative (though I always just change it to cream cheese). Here are some old photos from when Louise baked the cupcakes. She used buttermilk powder in place of the buttermilk and didn’t have any issues. And she also made the cinnamon frosting. This is the full recipe, but modified for cupcakes. Exact yield may vary depending on what size your cupcake wrappers are. I use large ones (not jumbo) and get about 18 cupcakes, but if you use regular size cupcake wrappers you may get up to 24. Preheat the oven to 325 degrees F. Line a muffin pan with 24 paper liners. In a small bowl, whisk together the cocoa powder, food coloring, and boiling water. Set aside to cool. With an electric mixer, cream the butter and shortening until smooth. Scrape down the bowl and add the sugar. Beat until the mixture is light and fluffy, about 5 minutes. Add the eggs, one at a time, beating well after each addition. Stir the buttermilk and vanilla into the cooled cocoa mixture. Sift the flour and salt together into another medium bowl (Pay attention! Don't add the baking soda. It goes in later...). With the mixer on low, add the flour mixture, alternating with the cocoa mixture, to the egg mixture in three separate additions, beginning and ending with the flour mixture. Beat until incorporated. In a small bowl, combine the vinegar and baking soda and stir until the baking soda dissolves; the mixture will fizz. Add to the batter and stir until just combined. Divide the batter among the prepared pans and smooth the tops. Bake until a toothpick inserted in the center of each cake comes out clean, about 15-20 minutes for cupcakes, rotating the pans halfway through the baking time. Transfer the muffin tin to a wire rack and let cool for 5 minutes or so, then remove cupcakes from pan and allow to cool on rack. In a small heavy-bottomed saucepan, whisk the sugar and flour together. Add the milk and cream and cook over medium heat, whisking occasionally, until the mixture comes to a boil and has thickened, about 20 minutes. Transfer the mixture to the bowl of an electric mixer fitted with the paddle attachment. Beat on high speed until cool. 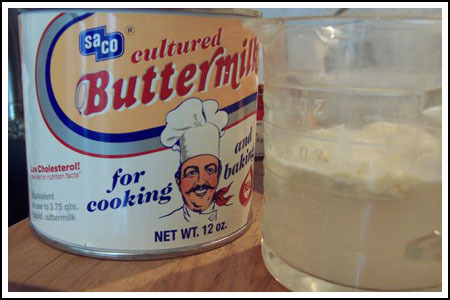 Reduce the speed to low and add the butter then beat until thoroughly incorporated. Increase the speed to medium-high and beat until the frosting is light and fluffy. Add the vanilla and cinnamon and continue mixing until combined. If the frosting is too soft, transfer the bowl to the refrigerator to chill slightly: then beat again until it is the proper consistency. If the frosting is too firm, place the bowl over a pot of simmering water and beat with a wooden spoon until it is the proper consistency. Frost the cupcakes. Garnish with Red Hots. So weird! You and I have eerie life parallels so often! Ok, so you’re in Italy, and I’m not. But I did just get back from NYC where I sampled an actual Baked red velvet cupcake. And my review is this: the cake was pleasant, but not tangy enough, and the cinnamon buttercream was silken and heavenly, but I wanted it on something else (carrot cake maybe), and a proper cream cheese frosting on my cupcake! Awesome! I have this book but haven’t experimented with it too much yet. Thanks for testing the waters! Oh wow those cakes look so good and that frosting, mouthwatering! Great post! Thanks, I actually had wondered about that! If the circular bottoms wouldn’t matter once they were in the pan and filled. Nice guest blog! 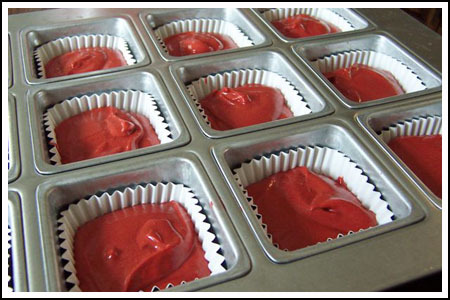 These are great red velvet cupcake, but like everyone else, I love the square muffin tin. Looked for one at Sonoma but they didn’t have them. Going to google it now! Jennifer – Regular cupcake liners work fine in the pans. My mom always made Red Velvet Cake with the cooked flour frosting, so to me that is the traditional flavor I remember. However, I love cream cheese frosting, so either one is a winner for me. I’ve used the powdered buttermilk for years and could never tell any difference tastewise between the powdered and fresh versions. My grandma and mom always did the red velvet with the cooked flour frosting. I think I would prefer the cream cheese as well, but yours looks really great! The square pans just take regular cupcake liners. I didn’t know they would be such a hit. If Anna lets me do this again, I’ll use my half sphere pans, but you need just the right recipe to show them off. If my theory of what the vinegar and baking soda does in this recipe is correct, maybe increasing it just a trace would give the final results I’m looking for in this cake. Like I said, it really is a great cake, just needs a little more tang. The square pans just use regular cupcake liners. I didn’t know my square pans would be such a hit. If Anna lets me do this again, maybe I’ll use the half spheres I have. But you need just the right recipe to show them off. If my theory is right about what the cider vinegar and baking soda actually does in this recipe, maybe just increasing it a trace would give the results I’m looking for. Louise, you’ve got me wanting those square pans too. Thanks again for your guest posting and reviewing. I’ll probably try the Baked red velvet cupcakes too, but since you’ve already done it we can move on to something else and come back to them later ;). The Cake Man Raven recipe looks a lot like Martha’s, but redder and maybe with more sourness? Not sure, but I like tasting the buttermilk and vinegar too. Fun for you to guest post, Louise. The cupcakes look great. FYI, I saw on ATK, Chris Kimball talked about buttermilk and said that powdered stuff is great. He said of course he recommends the real thing, but that the powder works great and he’d use it over homemade buttermilk (milk with lemon added). I do love the square cakes! Where do you find the square liners for the pans? I saw the square pans at TJMAXX! Great review! I love the dried buttermilk tip. Didn’t even know they made that dried. Will have to look for it. Definitely a very handy ingredient to have in the pantry! The pans are great. I’ve had them for several years so I don’t remember where I bought them, but they are Chicago Metallic. They are nice heavy duty pans. Those look great! I think cream cheese frosting is THE frosting for red velvet. LOL! The squares are really cool. Can you tell us where you got the pan? How FUN are those?? 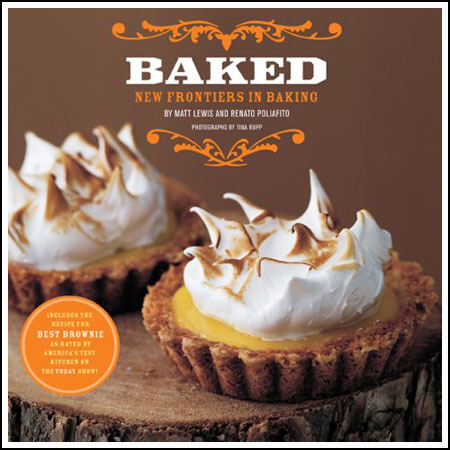 They look so good, and that frosting looks really interesting…I’ll have to try that soon. Those cupcakes…! SQUARE?? That’s amazing! I wonder where she got her cake pan!